Context: The literature of drug-drug interaction (DDI)-related uncontrolled causality, and preventability of DDI-induced UCG (HbA1c >7%) in outpatients glycemia (UCG) among outpatients with Type 2 diabetes mellitus is still limited. Aims: The aim of this study is to identify the prevalence, mechanism, severity, with Type 2 diabetes. Settings and Design: A cross-sectional study was conducted in Penang General Hospital. 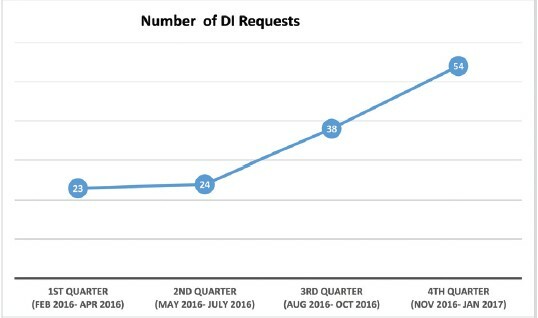 Methods: A computerized system for DDI checking was used to assess the severity and mechanism of DDIs. Drug interaction probability scale was used to evaluate the likelihood of DDIs. Preventability of DDIs has been determined by the instrument of Hallas. The UCG prevalence related to DDIs was further assessed. Statistical Analysis Used: SPSS 21.00 was used in this study. 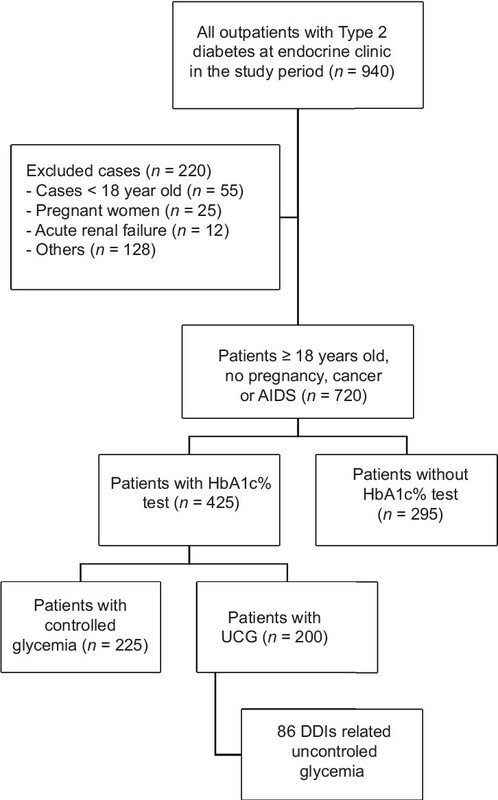 Results: From 425 outpatients with HbA1c% test, their mean age was 58.7 ± 12.8 years. Only 225 (52.9%) cases had controlled glycemia while 200 (47.1%) cases with UCG. They had multiple comorbidities, with a mean number of 3.8 ± 2.2/patient and often prescribed with multiple medications, with a mean number of 6.33 ± 4.67/patient. It has been detected that 86 DDIs causing UCG in 46 patients (23%) with range of (1 – 4) DDIs per patient. Drugs with DDI-induced UCG were as follows: diuretics (79%), salbutamol (9.2%), cortisones (5.8%), and others (6%). The majority of these DDIs were categorized as possible (77.9%) and preventable (37%). Conclusion: Nearly one-quarter of UCG was induced by DDIs; most of these DDIs are possible, and more than one-third are preventable. It was concluded that thiazide diuretics have the highest prevalence of DDI-related UCG. Background Quality of life is one of the parameters to check the improvement of hemodialysis treatment among hemodialysed patients. Those patients will be dealing with this treatment in long term if this treatment is the only way for them to replace their kidney function and this thing will affect their quality of life. Objective To evaluate the quality of life patients on hemodialysis using kidney disease quality of life-short term 24 (KDQoL-SF24) Malaysian Version. Materials and Methods Cohort observational study was conducted in this study. 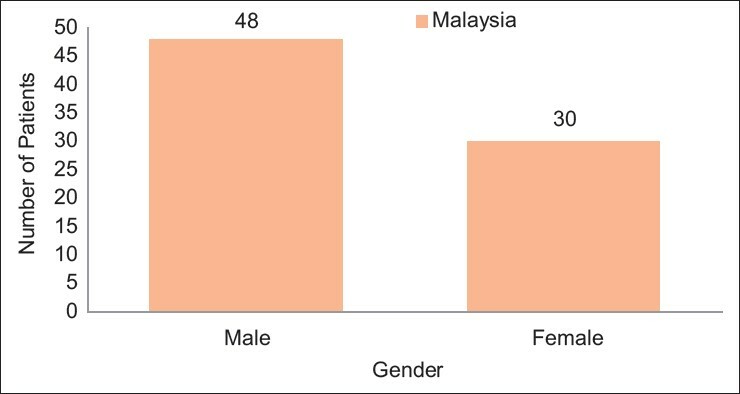 The study included 78 hemodialysed patients in HD center Penang, Malaysia. Results There were 9 components which had the lower of the mean and standard deviation (SD) than the standard form; work status (15.01 ± 35.57), cognitive function (75.66 ± 13.75), quality of life social interaction (76.32 ± 16.11), sleep (55.86 ± 15.30), social support (59.61 ± 22.08), patient satisfaction (43.24 ± 15.32), physical functioning (50.06 ± 42.81), general health (29.62 ± 25.56), and role emotional (54.27 ± 49.92). In this HD center, the group of patient’s age who had the lower mean ± SD from the KDQoL-SF Manual Standard were the first and the sixth groups of patient’s age (≤20 and 61–70). Conclusion The study conducted in HD center, Penang, Malaysia showed that the scoring of work status, cognitive function, quality of social interaction, sleep, social support, patient satisfaction, physical functioning, general health, and role emotional were low than standard form. Introduction: Primaquine is vital for the management of liver-stage Plasmodium vivax and Plasmodium ovale malaria. However, primaquine effectiveness is dependent on various factors and differs between populations. Therefore, this study was conducted to identify factors that affect the length of stay and relapse during primaquine combination treatment in malaria-infected patients in the local setting. 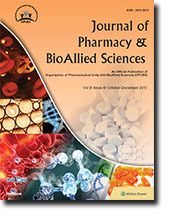 Materials and Methods: A retrospective study on the use of primaquine combination among P. vivax and P. ovale infected patients in Selangor, Malaysia within a 5-year period from 2011 to 2015 was obtained from the National Malaria Case Registry, Malaysia. Data collected were patient characteristics (age, gender, nationality, glucose-6-phosphate dehydrogenase, pregnancy); disease characteristics (survival, past malaria infection, parasite type, presence of gametocyte, parasite count, week onset, severity, transmission type); and treatment characteristics (type of antimalarial, treatment completion). Outcome measures were length of stay and relapse during a 1-year follow-up. Results: A total of 635 patients were included in the study. Based on a multivariate logistic regression analysis, the significant predictors for length of stay were gender (P = 0.009) and indigenous transmission (P < 0.001). Male patients had a shorter length of stay than females by 0.868 days (P = 0.009), and indigenous transmission took 1.82 days more compared to nonindigenous transmission (P < 0.001). Predictors for relapse were indigenous transmission of malaria (P = 0.019), which was 15.83 times more likely to relapse than nonindigenous transmission (P < 0.01). Conclusions: This study reveals that the effectiveness of primaquine was clinically associated with gender and indigenous transmission. To that end, vigilant monitoring of primaquine use is required to reduce relapse and future transmission. Background: The complexity of drug therapies has increased the need to evaluate the drug information scientifically. In this regard, the aim of drug information centers (DICs) is to promote rational use of drugs in a health-care setting. DI pharmacists play a vital role in providing the necessary and reliable information on drugs to promote the concept of rational drug use, eventually leading to a better patient outcome. The objective of the present study was to assess the drug-related queries received by the DIC at the King Saud Medical City (KSMC) from health-care professionals working in a large tertiary care setting. Methods: A retrospective analysis was conducted from February 2016 to January 2017. Data were collected using the DI request form, available in both printed and electronic formats for use by the health-care professionals. Descriptive statistics were used to calculate frequencies and percentages. Data analysis was performed using the Statistical Package of the Social Sciences software, version 16.0. Results: The current study received a total of 139 queries that were answered by the DIC pharmacists over a period of 1 year. The majority of queries were asked by pharmacists (61.2%), followed by physicians (23.7%) and nurses (10.10%). About half of the queries were related to the dosage and administration of the drugs. Lexicomp® acted as the common resource of information. Conclusion: DIC has been instrumental in the dissemination of drug-related information to health-care professionals since its inception in February 2016, resulting in the provision of quality health care to the patients. However, based on yearly queries, there still exists a need to increase the awareness of health-care professionals about the DIC at KSMC, which will urge them to take drug consultation from DIC pharmacists and promote patient safety. Objective: The objective was to report academic stress and prevalence of stress-related self-medication among undergraduate female students of health and nonhealth cluster colleges at a public sector university in Dammam, Saudi Arabia. Materials and Methods: A 5-month cross-sectional survey was conducted in the university. The survey included the English version of 10-item Perceived Stress Scale (PSS) to report self-perceived stress. Student responses were analyzed by SPSS version 22 software. Results: The majority of students (85%) perceived examinations as a stressor. Most of the students (64%) had perceived moderate stress that increased as students progressed from preparatory year to 4th year. It declined in students of 5th and 6th year. The prevalence of stress related was reported at 39.58%. Highest prevalence of stress-induced self-medication was reported from College of Nursing (59.09%) and lowest (29.69%) from clinical pharmacy. Most common drug used to self-medicate during stress was caffeine (49.5%). The PSS score was significantly associated with colleges and study levels. Conclusion: Students studying in health cluster colleges reported high academic stress and self-medication practice. The major stressors identified were examination and course load. Student counseling sessions and counseling by pharmacists regarding self-care may help in the reduction of such stressors and may promote responsible self-medication. Self-evaluation and quality assurance process of curriculum may highlight areas for improvement in the courses. This may help in lowering academic stress among students. Objective: In recent decades, the overexpression of microRNA-21 (miR-21) is found to be progressively linked with many diseases such as different types of cancers, cardiovascular diseases, and inﬂammation. Thereby, it has become an attractive target for pharmacological and genetic modulation in various diseases, and also for overcoming the resistance to chemotherapy in several cancers. 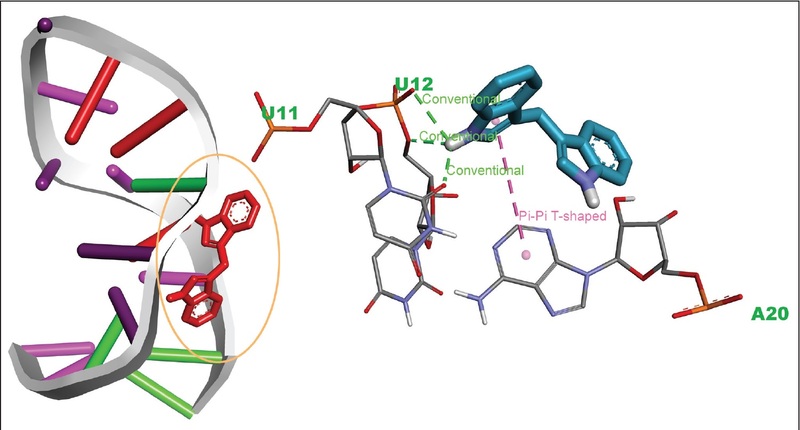 Here, in this study, the role of molecular therapeutics of 3,3′-diindolylmethane (DIM) has been investigated for its ability to bind with the precursor miRNA as a target of miR-21 (hsa-mir-21), which may alter the catalyzation process of dicer, a RNase III enzyme, involved in miRNA transcription. Methods: In this context, the present study describes the potential binding and the structure alteration properties of DIM to precursor miR-21 (pre-miR-21) through Molecular Docking and Molecular Dynamics simulation techniques. Results: As a corollary, DIM formed both non-bonded and covalent interactions with the bases of pre-miR, while covalent interaction with guanine in the 6th position was found to be consensus in molecular dynamics simulation. Furthermore, the stability of both DIM and pre-miR-21 was found to be inversely correlated to each other in binding condition. Conclusion: This result indicates that DIM can be used in target-based therapy and also as a lead for further development of potent small molecule miRNA antagonist. Aims: Despite an increased popularity of print and electronic media applications, there is a paucity of data reflecting doctors’ opinions regarding efficient utilization of these resources for the betterment of public health. Hence, this study aimed to investigate the perception of physicians toward the effect of electronic and print media on the health status of patients. Setting and Design: The current research is a cross-sectional study conducted from January 2015 to July 2015. The study population comprised physicians rendering their services in different hospitals of Karachi, Pakistan, selected by the nonprobability convenience sampling technique. In this study, 500 questionnaires were distributed through email or direct correspondence. Methods and Materials: Physicians’ perception toward the impact of electronic and print media on the health status of patients was assessed with a 20-item questionnaire. Different demographic characteristics, such as age, gender, institution, position, and experience of respondents, were recorded. Quantitative data were analyzed with the use of Statistical Package for Social Sciences, version 20.0 (SPSS, Chicago, IL). The association of the demographic characteristics of the responses of physicians was determined by one-way ANOVA using 0.05 level of significance. Results: In this study, 254 physicians provided consent to show their responses for research purposes. A response rate of 50.8% was obtained. Nearly one-third of the respondents negated that patients get health benefit using electronic and print media. The majority did not consider electronic and print media as lifestyle-modifying factors. Physicians thought that patients particularly do not rely on mass media for acquiring health information and consider healthcare professionals as unswerving information resource. Conclusions: Mass media can be productive resources to augment awareness among patients, although physicians seem unconvinced about the extended usage of print/electronic media. Asthma is considered as one of the most common chronic diseases in the world. As a result of serious physical, social, and psychological complications, asthma can reduce health-related quality of life (HRQoL). The present study was designed to assess the HRQoL including physical health, general health perception, emotional health, psychological health, and social functioning of asthmatic patients in Pakistan. A descriptive cross-sectional study design was used. Setting was public and private healthcare facilities. SF-36 was self-administered to a sample of 382 asthmatic patients. After data collection, data were clean coded and entered in SPSS version 21.0. Skewness test was performed and histograms with normal curves were used to check the normal distribution of data. Descriptive statistics comprising of frequency and percentages was calculated. The non-parametric tests including Mann–Whitney and Kruskal–Walis (P ≥ 0.05) were performed to find out the difference among different variables. The results of the current study highlighted a significant impact on several domains of HRQoL for asthmatic patients. 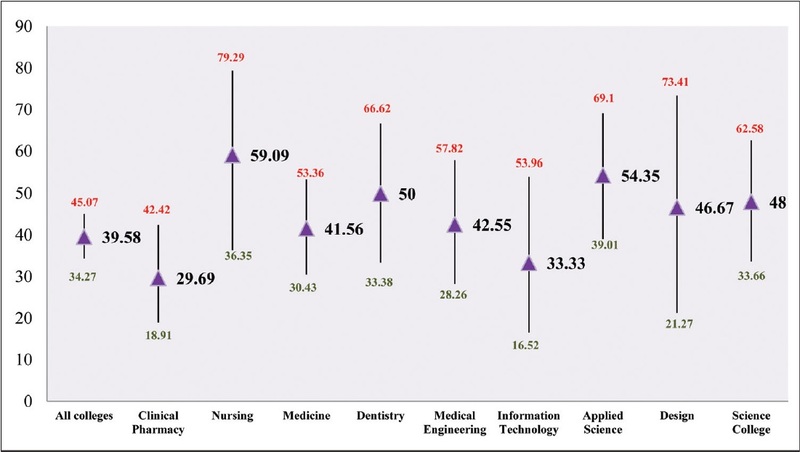 Lowest scores for HRQoL were observed in the domain of general health (27.74 ± 18.29) followed by domain of mental health (38.26 ± 20.76) whereas highest scores were observed in the domain of social functioning (45.64 ± 25.89). The results of the study concluded that asthmatic patients in Pakistan had poor HRQoL. Well-structured pharmaceutical care delivery in the healthcare facilities can contribute toward better patient knowledge and management and can ultimately improve the HRQoL of asthma patients. Hypertension is a pathological condition in which the blood pressure is higher than under normal physiological conditions, i.e., 140/90 mmHg or higher. Blood pressure is measured as the force exerted by the blood pumped by the heart against the walls of arteries (aorta) and distributed throughout the body. Use of complementary and alternative medicine as a cure for hypertension is a common phenomenon because of the high risk of cardiovascular complications and kidney diseases caused by conventional Western medicine. It is reported that high blood pressure causes ~49% of myocardial infarction and 62% of strokes. Effective treatment of hypertension is restricted by adverse effects and cost of the medication. Moxibustion is the application of heat by burning a small bundle of tightly bound moxa, to targeted acupoint, and sometimes it is used along with acupuncture. Encouraging results have been reported on randomized trials indicating the efficacy of moxibustion. But more controlled clinical trials are required to further establish the potential efficacy of moxibustion approach in hypertension. Cardiac arrhythmias are a major cause of morbidity and mortality across the world. Learning the science behind the use of antiarrhythmic drugs is essential for all medical graduates. However, many antiarrhythmic drugs are available, and most of them have complex pharmacodynamic and pharmacokinetic profiles. We tried to improvise our teaching by conducting interactive, worksheet-based, small-group discussion on antiarrhythmic drugs with preclinical students of School of Medicine, Taylor’s University, Malaysia. This survey was conducted to analyze the outcomes of worksheet-based, small-group discussion. A 38-year-old male suffering from a low backache since 3 months was diagnosed as a case of L4-L5 disc prolapse after magnetic resonance imaging examination. He was treated with tolperisone, aceclofenac, and paracetamol in these drugs deflazacort added later. 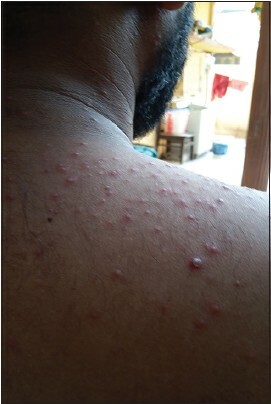 From the 2nd day of an addition of deflazacort in the therapy, sharply marginated, infiltrative, and erythematous skin eruptions with discrete itching sensations were seen. It was diagnosed as deflazacort-induced acneiform eruption and treated with doxycycline for 2 months which led to the disappearance of acneiform eruptions.